SPECIAL REPORT: ADVANCED BIOSCIENCE RESOURCES, INC.
Advanced Bioscience Resources, Inc. (ABR) is likely the oldest continuously operating wholesaler of aborted fetal body parts in the United States. Headquartered in the San Francisco east bay area in Alameda, California, ABR has played middle-man for tens of millions of dollars in transactions over freshly aborted baby body parts since its founding in 1989. ABR’s yearly revenues are about $1.1 to $1.5 million, all from the sale of freshly aborted fetal organs and tissues. After CMP’s reporting prompted multiple Congressional investigations, ABR was one of the fetal tissue procurement companies scrutinized by the Senate Judiciary Committee and House Energy & Commerce Committee’s Select Investigative Panel. After over a year of reviewing primary-source documents from ABR, the Congressional investigations made a criminal referral of ABR and its long-term business partner, Planned Parenthood of the Pacific Southwest (PPPS), to the FBI and U.S. Department of Justice in December 2016 for selling fetal tissue against the law. The House Select Panel also referred ABR to the Riverside County District Attorney’s office in southern California, where ABR has harvested and purchased body parts from PPPS for many years. In December 2017, the USDOJ announced that it is investigating PPPS and ABR for sale of fetal body parts. Federal law forbids the transfer of fetal tissue in exchange for “valuable consideration.” This term is a standard one from contract law and denotes anything of value. “Profit” is a helpful proxy for “valuable consideration”: if you made a profit from fetal tissue, you necessarily broke the law. However, profit is not necessary to constitute a violation of the statute—indeed, “consideration” can be as little as one cent. The real crime is not in the amount of money for which an aborted fetus (or his or her heart or brain) is sold, but in the act of commodification. This is somewhat analogous to the sale of illegal drugs, where again it is not the amount of money that is determinative, but rather the commercial transaction over something forbidden to be marketed. ABR is organized on paper as a 501(c)3 non-profit foundation, but its billing practices for fetal organs and tissues demonstrate that it is a profit-driven business selling fetal body parts for valuable consideration. In 2016, ABR netted over $200,000 in profit. While state and federal fetal tissue laws allow the reimbursement of specific packaging and shipping charges, ABR’s Fees For Services Schedules and customer invoices bill separatereimbursement charges for the costs of packaging, quality control, and shipping. But in addition to the cost reimbursements, ABR then charges hundreds of dollars for each fetal body part itself. 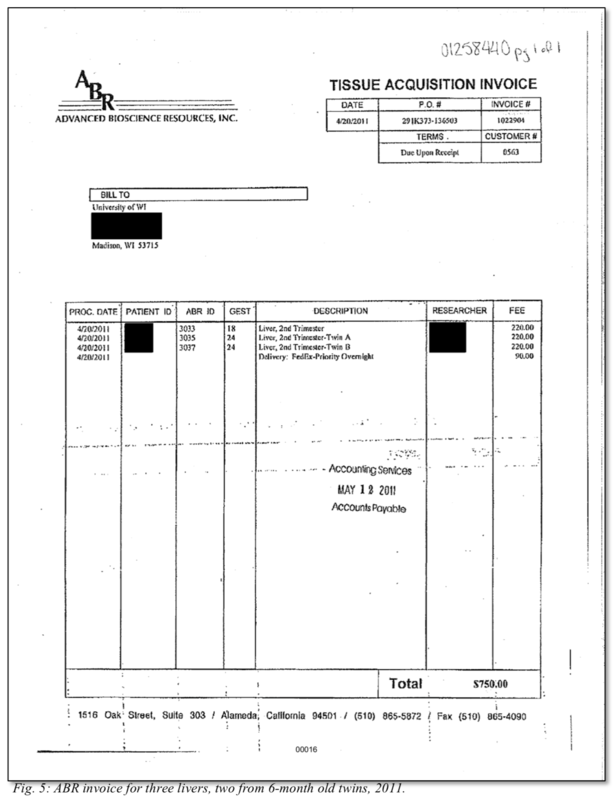 ABR’s customer invoices even show ABR charging the customer doubleif two eyeballs were harvested from the same baby—even though the ABR technician would harvest both from the same skull at the same time, and the eyeballs would be packaged together a one shipment! The invoices show ABR routinely shipped multiple body parts together in one package, charging a single shipping reimbursement for the order, but multiple specimen charges for each body part. The Senate Judiciary Committee’s report and criminal referrals found: “As demonstrated by its fee schedules, ABR’s fee per specimen substantially increased from 2010 to 2015,” and “ABR provided no explanation as to why its fees to its customers rose so steeply from 2010 to 2015 despite no corresponding increases in the wages it paid its technicians or in the fees it paid the Planned Parenthood affiliates.”ABR was charging $200 for a 2nd-trimester fetal heart or liver in 2010, but after increasing by $10 to $45 per year, that charge had more than doubled to $340 by 2015. According to the U.S. Bureau of Labor Statistics, ABR’s increased charges for fetal body parts from 2010 to 2015 represent a 60% greater increase over the rate of inflation during that time. During this time, ABR also began charging wildly escalated fees for “Regulated Tissue Acquisition” for special-demand, high-quality fetal body parts—pristine organs and tissues that ABR would pay Planned Parenthood up to $1,000 for if the specifications were met. In 2012, ABR charged its customers $5,000 for an RTA-procured fetal organ or tissue—$2,000 for Phase 1, and $3,000 more in Phase 2. ABR later increased the fee to $6,000 total, $3,000 per phase. I calculated the costs for travel, hotel, time, food, personnel time, clinic fees and some overhead in the scenario of a non-useable product and I figured your costs to be around $3,000. Therefore, instead of charging the full $6,000 or $7,000, I would recommend $3,000. 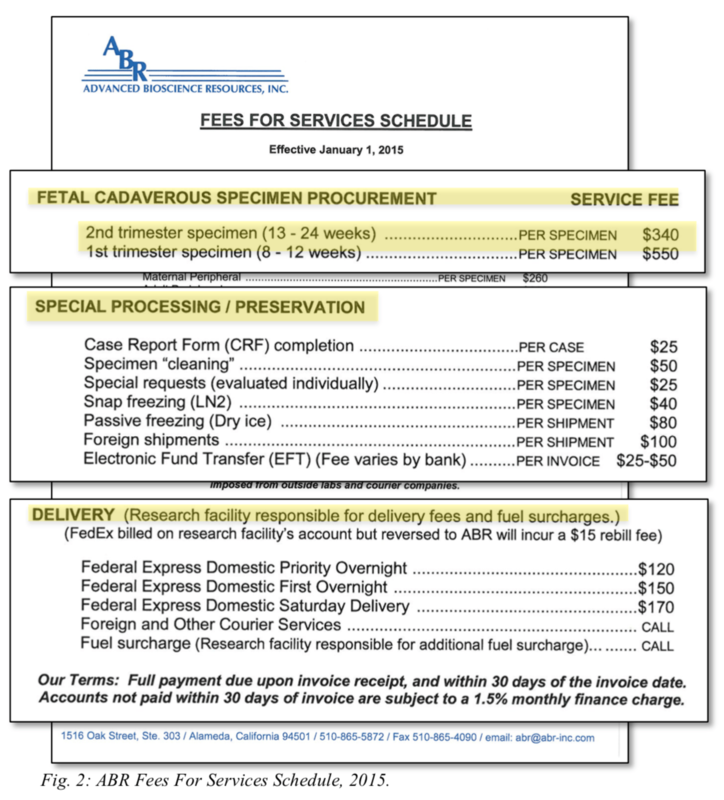 ABR harvested, purchased, sold, and shipped fetal body parts from inside of Planned Parenthood Pacific Southwest’s two late-term abortion sites—ABR’s entire operation has been knowingly harbored inside of Planned Parenthood for years. Additionally, the substantial overcharging and profiteering involved in ABR’s fetal tissue sales to taxpayer-funded research entities may implicate both ABR and Planned Parenthood in potential False Claims violations. Planned Parenthood of the Pacific Southwest, formerly known as Planned Parenthood of San Diego and Riverside Counties, is a large and wealthy Planned Parenthood affiliate doing business in southern California. PPPS performs nearly 17,000 abortions every yearand operates two main surgical abortion offices, one in downtown San Diego and one in Riverside. The San Diego and Riverside clinics both advertise abortions up to 6 months (24 weeks) for any reason.Since at least 1999, PPPS has had a contract with ABR to supply aborted fetal organs and tissues. In 2010, the same year that PPPS and ABR entered into this agreement, PPPS performed 15,629 abortions.If each abortion “provided” just one fetal organ under the contract, that would bring in an extra $937,740 in revenue to Planned Parenthood Pacific Southwest each year. Whether, based on customer demand, PPPS and ABR were actually able to achieve such numbers or not, the promise of the contract is clear: PPPS and ABR are transacting for fetal organs on a marketable volume basis, and this contract is worth up to $1 million annually for Planned Parenthood. Throughout the length of PPPS’s business relationship with ABR, Planned Parenthood and ABR arrived at newer iterations of their contract that provided greater financial benefit to Planned Parenthood in exchange for fetal body parts. 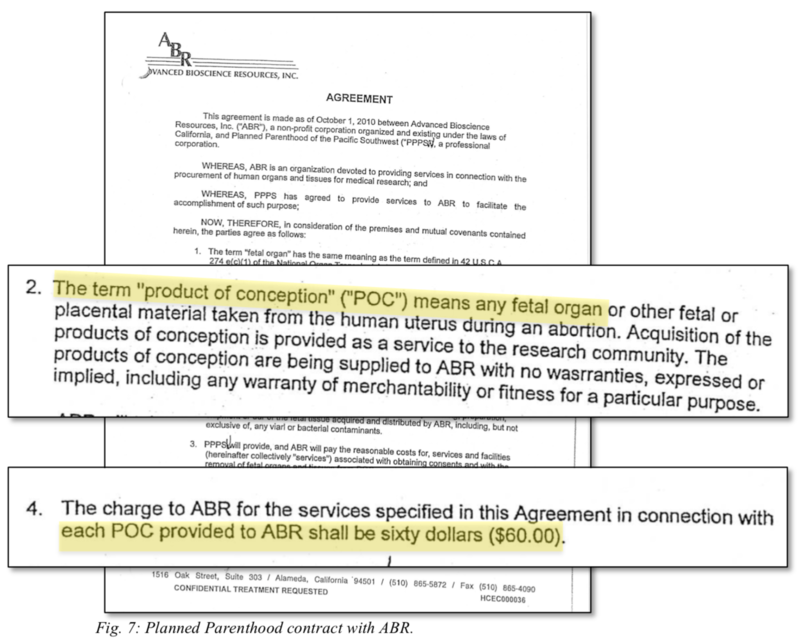 In the first PPPS/ABR contract, signed in 1999, Planned Parenthood charged ABR $45/fetal specimen provided. In 2005, the charge was increased to $55/specimen, and in the 2010 contract to $60/specimen. 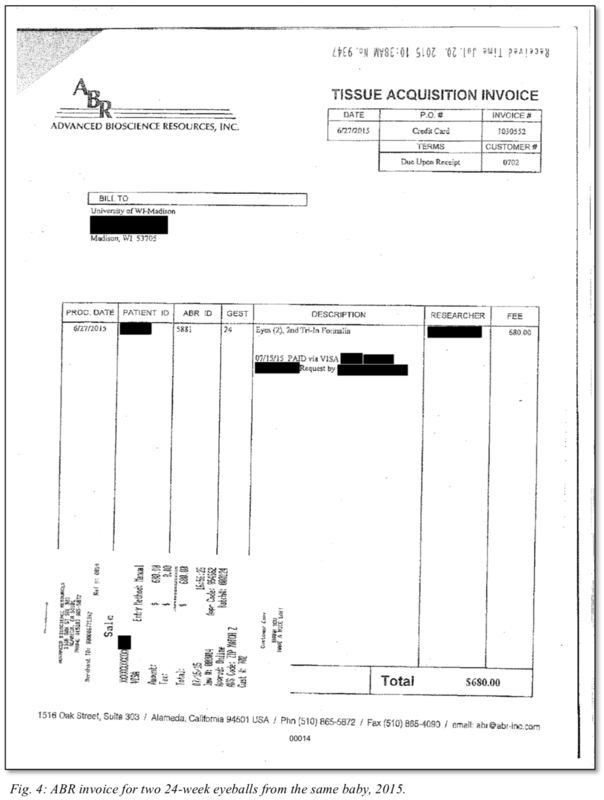 In 2012, PPPS and ABR negotiated an “addendum” to the 2010 contract that allowed ABR to harvest special-order high-quality fetal body parts in a 2-phase “Regulated Tissue Acquisition” process, where Planned Parenthood could receive a total of $1,000 for a single successful RTA-procured body part. If the RTA did not yield usable fetal tissue, ABR would only pay PPPS half the price, $500. These RTAs are the fetal organs ABR would in turn sell to research customers for $6000 per specimen. Recent reports show the FDA signing a contract with ABR for nearly $16,000 worth of “fresh” fetal organs and tissues over the next year (assuming this FDA laboratory does not require more body parts after this initial quota), in a continuation of prior FDA contracts with ABR.Sadly, ABR, along with other companies like it, has been a nexus point for government involvement in fetal experimentation for many years. In the past two years alone, the NIH spent over $200 million on research projects using human fetal tissue.In 2017, intramural NIH research—studies conducted in government laboratories, not merely government grants—accounted for $20 million, or about 20%, of NIH spending on projects using human fetal tissue. Neither of these two experiments was designed to treat or cure a human being’s illness. However, it bears noting that when fetal stem cells have been used in attempted cell-based therapies in human beings, the results have been ineffective and dangerous. For example, an attempt in 2009 to treat a boy with A-T using aborted fetal brain cells generated tumors in his brain.StemCells, Inc., one company that has tried to develop fetal stem cell therapies similar to the one used in the A-T case, had a whistleblower lawsuit filed against it in 2014 alleging impurities in its fetal brain-derived cell lines that put patients at risk of infection or death.A StemCells, Inc. clinical trial using aborted fetal brain cells to treat spinal cord injury (SCI) “did not see significant recovery of motor functions” in patients, and was ultimately terminated.Later studies of StemCells, Inc.’s fetal stem cell product in animal models of Alzheimer’s found the fetal brain cells formed abnormal “ectopic clusters” and provided no cognitive benefits.The ineffective and dangerous fetal brain cell product developed by StemCells, Inc. was produced from fetal brain and spinal cord specimens provided by ABR. Meanwhile, studies using adult autologous (from the patient) stem cells have shown motor improvement in SCI patients since 2008.In a 2012 study of patients with cervical SCI, patients who received multiple transplants of autologous bone marrow stem cells showed improved motor function.In a 2015 study, a 15-year-old paraplegic patient was able to walk again after receiving stem cell injections from her own bone marrow. The reality of legal abortion in America—subject to various limits imposed by law—does not cancel the humanity of unborn children in the context of scientific experimentation. In fact, as has been said before, it is precisely the value of the aborted fetus to medical experimentation that proves his or her common humanity with every other American citizen.Laws like the federal prohibition on the purchase and sale of fetal body parts for valuable consideration are meant to prevent the utilitarian and commercial destruction and commodification of unborn children, and promote their welfare instead. It is an incredible irony and disappointment that the same government that ought to be enforcing such laws, might instead be doing business at taxpayer expense with violators like ABR and their business partners at Planned Parenthood. While 42 U.S.C. 289g-2(e)(3) excepts from “valuable consideration” reimbursements for specific costs of facilitating a fetal tissue donation, if the payments exceed the costs, or are tied to the marketability of the fetal tissue, the statute is being violated. See ABR 2016 IRS Form 990, Ibid. Rini, Suzanne M. Beyond Abortion: A Chronicle of Human Fetal Experimentation(1993). Special thanks to Lynn Mills for providing many public records documents.